There is no need to buy Windows Vista Ultimate edition just for the sake of having Windows DreamScene feature, also known as motion desktop or video animated desktop wallpaper. Other than VLC Player which can be used to display a video as desktop background in Windows, Mac OS X, and Linux variants operating system, the free BS.Player also supports the ability to play video file on your desktop. The BSPlayer Windows DreamScene alternative also has another advantage, that it’s less resource hungry. Thus the system does not need the high specifications especially on graphics card that required by Aero, a prerequisite for DreamScene to run. Download BS.Player. Two versions available – BS.Player Free or BS.Player Pro. The free version is supported by adware Whenu Save!. That possibly is the only downside to use BSPlayer as the tool to implement video wallpaper. Once you download and install the BS.Player, run BS.Player and open your favorite movie or video clip that you would like to set as desktop background. 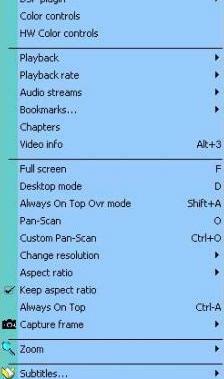 Then right click on the video playing on a window, and select “Desktop mode” on the options menu. Alternative, you can just press D shortcut key. And voila, your video is now playing on your desktop, without disturbing the operation of other desktop features.